Jason began his time in Rangers in 1989 at the age of 5 and has been heavily involved ever since. 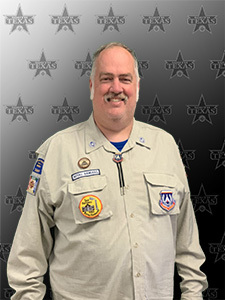 He leads the Adventure Rangers group at Spring First Church and serves as the National Council President on the national Royal Rangers executive committee. 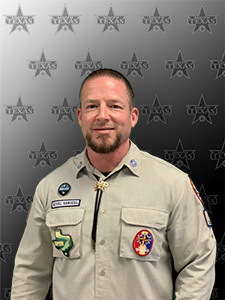 While growing up in Royal Rangers, Jason earned the Gold Medal of Achievement in 1999, became a member of Frontiersmen Camping Fellowship in 1997, served as Chapter Scout from 2000-2002 and completed his Wilderness vigil in 2005. As a leader, Jason has completed the Platinum level of the Organizational Leaders Training, earned the Medal of Excellence, completed the 'Advanced' level of the Outpost Leaders Advancement Levels and attended Advanced Academy, the Johnnie Barnes Excellence Initiative, National Rangers Ministry Camp, World Class Outpost, Ranger Kids Training Conference, National Training Camp, and Advanced National Training Camp. 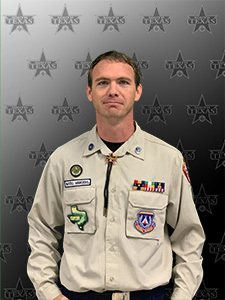 Jason also serves as an Instructor Trainer and Academy Instructor as a part of the Rangers Ministry Academy. Jason is a third-generation Royal Ranger leader and his number one desire in Royal Rangers is to see Spirit-filled leaders develop meaningful mentoring relationships with young men through effective discipleship and training. Jason and his wife Amanda were married 2007 and currently live in Cypress with their two beautiful daughters while owning and operating a private preschool. Jason is a credentialed minister with the General Council of the Assemblies of God, holds a B.B.A. in Management from Texas A&M University and has completed his diploma in Royal Rangers Organizational Leadership through Berean School of the Bible. Ken moved to San Antonio in the 3rd grade and started in Scouting same year. Over the years, he worked his way through and is an Eagle Scout. He completed much of the Scouting Junior training program and served many junior staff positions. He played baseball, football and was on 2 city championship soccer teams. Ken fell in love with the Lord Jesus at the age of 31. He became a Royal Rangers Commander and has been serving in that capacity for nearly 25 years . He has served as a Trailblazer and Air, Sea Trail Ranger, Discovery, Adventure, Urban Rangers and Expedition Rangers Commander. Currently he serves as the Men's Ministries director at Camelot Christian Center in San Antonio, TX. 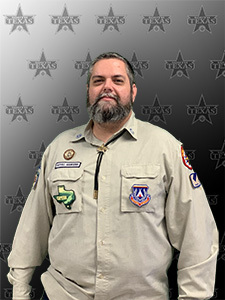 Outside of his responsibilities in South Texas, Ken is a member of the national Royal Rangers executive committee and serves as the South Central Region Coordinator. He served as the San Antonio Section Director for 2 years, Deputy Sectional Commander for the San Antonio Section for 6 years, District Public Relations Coordinator for 3 years and as the District Outreach Coordinator for 1 year. His training includes NRMC, NTC, LMA, and most recently National Academy and Advanced Academy. He is also a Red Cross Certified Fundamentals of Canoeing Instructor. He has also served on camp staff for 3 JTC camps, 2 AJTC camps, 2 JCE camps, and one Elite JTC camp. He is passionate about Junior Leadership Development Academy and sewing spiritual, relevant, experiential, and usable skills into boys lives. He also coaches Special Olympics Softball for the San Antonio Fire softball team. This team was chosen to represent Special Olympics Texas, and the United States of America at the Special Olympics World Summer Games in Athens, Greece in June of 2011. In Athens they won the Gold Medal. Ken married his wife Yvette in September of 2002. His son is 27 and has Down Syndrome, he has 1 daughter in college and 1 daughter working on ministry training. He attended The University of Arkansas, San Antonio College and Texas State University. He currently is the owner-operator of a home improvement contracting business. Chad is a 3rd generation Ranger, and has been involved since ‘Straight Arrows’ at age 5 in 1985. As a junior leader, he assisted his Commanders on many outpost events and outings. At 15, his outpost's adult leadership retired and while serving as a ‘Junior Commander’, Chad single-handedly ran his outpost of 30 boys. As an adult leader Chad has sought Royal Rangers training both internally and externally, earning his LMA and his Advanced Outpost Leader Advancement Level in addition to completing several training events such as NRMC, NTC, ANTC, WCO, Training Academy, and National Academy. As a servant of Royal Rangers, Chad has run or volunteered in countless events including national, State, district, sectional and local outpost training, outings, and competitions. Chad holds a Logistics and Industrial Engineering degree from Texas A&M University. He and his wife Misty developed and own 3 private preschools and enjoy raising their 4 children. Additionally, Chad serves on the board as a Trustee for Calvary Church and coaches both his son’s and daughter’s soccer teams. Chad enjoys several occasional hobbies with his kids such as camping, shooting, and woodworking. He and his wife enjoy watching movies and playing video games together. Damon Barber has been involved in Royal Rangers since 1979, beginning his Rangers career a bit early as a Straight Arrow at age four. As a young man he earned multiple Outpost Ranger of the Year awards, Section Ranger of the Year and attended JLTC, JLATC, JLTT and became a member of FCF in 1991. 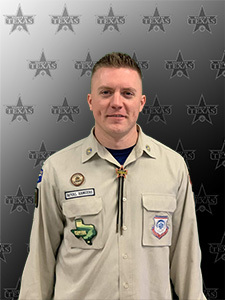 He has also served on staff for two JLTCs and served at the North Texas District's "Camp Sarge Sellers" as a camp advisor, instructor and council fire assistant. Upon graduating from Alief Elsik High School in 1993, Damon attended and graduated from the Houston Community College System with an Associate's degree in Science. Damon attended NTC in 1994 and completed the standard LTC as well as BSALTC. 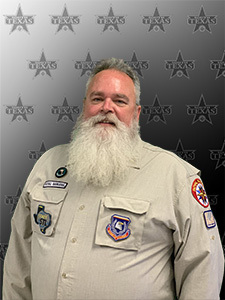 In the 1990’s, Damon served on the Houston Section Staff as Staff Aide and Area Commander. during this time he became a Training Chief and assisted with the instruction of one Standard LTC and coordinated two LTCs, acting as the lead instructor. Damon and his wife, Myrna, currently attend Calvary Church, Outpost 223, where he serves as an Assistant Commander for the Discovery Rangers on Wednesday nights and Adventure Rangers on Sunday nights. Since 2010, Damon has completed Ranger Basics, Ranger Essentials, Safety and the Church, WCO, NRMC, OLAL- Advanced level, Training Academy and National Academy. Damon and his wife have two daughters (Gracie and Lilly) and currently live in the Richmond area where Damon is a licensed Journeyman Wireman electrician. He and Myrna started a cookie business in 2015 that they operate out of their home in accordance with the Texas "Cottage Food Law". T. J. Arnold got into Royal Rangers with his son, Jaylon, at Victory Assembly of God in Universal City, TX; the home of Outpost 173. 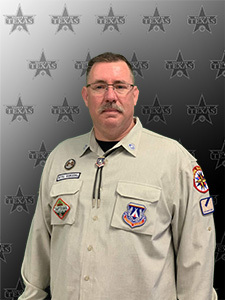 He has served as a Commander at the Discovery Rangers, Adventure Rangers, and Expedition Rangers level and is currently the Assistant Outpost Coordinator. He has served as the Powwow Stage Manager, Camp Store Manager and Assistant Communications Coordinator at the district level and is currently serving as the District Communications Coordinator. Since joining the Royal Rangers in January 2014, he has completed Ranger Basics, Ranger Essentials, Ranger Safety, WCO and NEEC to earn his Advanced Level of the Outpost Leader Advancement Levels. He has been awarded the Outpost Leadership award and most recently, the District Leadership Award. Professionally, T. J. is an Air Force veteran and currently works as a contractor for the Army in the information technology field. He holds an A.A.S. in Electronic Systems Technology from the Community College of the Air Force and a B.S. in Business Information Systems from Bellevue University along with various I.T. certifications. T. J. and his wife, Sherieka, have two sons, Reggie and Jaylon. His wife serves in the church as a youth leader, serves on the kitchen ministry and leads a fitness ministry. He currently serves as Treasurer on the Administrative Board and as the church softball coach. His hobbies include softball, PC gaming, graphic design, website development, watching football and baseball and going on outdoor adventures with his sons and his outpost. Phillip attended his first Royal Rangers meeting as a Buckaroo in 1983 at the age of 8 where he earned his “Top Hand” award. Because of family movement, he left Royal Rangers but came back as a Trailblazer and earned his “Advanced” before moving away again. 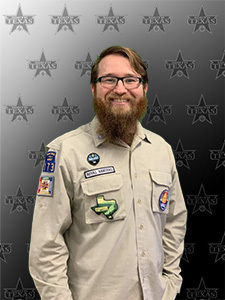 Phillip returned to Royal Rangers again in 2013 as a Discovery Rangers Commander at Victory Assembly of God, Outpost 173. He has worked hard to help multiple boys earn their Gold Falcon. He earned his OLAL-Advanced in November of 2016. He was selected to attend and graduated from Training Academy in January of 2018. In February of 2018, he completed the FCF Adventure and became a member of the Texas Independence Chapter. In June of 2018, he was appointed to the San Antonio Section staff as the Sectional Chaplain. In August of 2018, he was appointed as the South Texas District Assistant Missions Coordinator. In September of 2018, he was invited to and graduated from the National Academy at Camp Eagle Rock. In January of 2019, he was promoted as the Missions Coordinator for the South Texas District. He has served on staff at Powwows, JLDA and other sectional and outpost events. Away from Rangers, Phillip is a decorated Police Officer serving his hometown of Converse, TX since 2002. He enjoys coordinating and running community relations events for the department. At Victory Assembly of God, Phillip serves in the children’s department as BGMC Director and works with the Men’s Ministry. He and his wife, Cheryl, enjoy being Discovery Rangers Commanders together and they are looking forward to doing missions work in the future with Pathfinders and RRI. John attended his first Royal Ranger outpost meeting in 1986 at the age of 13. He attended Junior Leadership Training Camp in 1988 where he received the Baptism in the Holy Spirit for the first time. At the age of 18 he completed leadership training and was serving his outpost as a Lieutenant Commander. Previously, John has served as the West Division Director of the Pennsylvania-Delaware (Penn-Del) District from 2009-2017, also serving on the camp council for Camp Berry (the district campground) during that time. He was the Outpost Coordinator for Outpost #229 in Mount Morris, PA for 11 years. John went off to Valley Forge Christian College in the fall of 1991 to pursue education in youth ministry where he helped start an outpost in Coatesville, Pennsylvania. John has completed the Advanced Level of the Outpost Leader Advancement Levels, is a Certified Instructor as part of the Rangers Ministry Academy, attended National Training Camp, World Class Outpost, the Johnnie Barnes Excellence Initiative, National Ranger Ministry Camp, National Elementary Education Conference and served on staff at multiple Junior Leadership Development Academies. John has a desire to see all boys come to the saving knowledge of Jesus Christ! God has given him a passion to accomplish this task through promoting the mission of Royal Rangers to all who will hear. John and his wife Janet were married in 1996 and now have two daughters, Breanna and Rachel. Samuel joined Royal Rangers at the age of 6 and has been involved ever since. He earned his Gold Medal of Achievement in 2002 and served as a junior leader during college. He became involved in FCF as soon as he was allowed, serving as the District FCF Scout and competing for Territorial Scout during his high school years. He currently is a Buckskin member of FCF with plans to advance to Wilderness in the next 2 years. In 2009, Samuel was appointed as outpost coordinator of Outpost 90 in La Porte, TX; the same church he completed his achievements at as a boy. Since that time he has been serving faithfully at his church ministering to both the boys and men in the Royal Rangers program as well as serving on the church worship team. Samuel still considers himself as a Royal Ranger and works to instill the values of Rangers in all the current and future men he comes into contact with. Samuel has attended Ranger Basics, Ranger Essentials, Ranger Safety, and World Class Outpost. He will attend National Ranger Ministry Camp this October to complete his 'Advanced' outpost leader's training. He is a certified NRA instructor and is excited to start training courses for shooting sports in South Texas. Samuel and his bride Gabby married in 2012 and live in Galveston, TX with their dog, Gatsby. He works at the University of Texas Medical Branch as an Assistant Professor in Integrative and Behavioral Medicine, Division of Family Medicine. He also is a certified medical acupuncturist.